Congress Place, the headquarters of the People’s National Congress Reform. 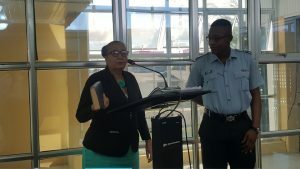 In the wake of the Chairman of the Commission of Inquiry into the administration of Georgetown, Retired Justice Cecil Kennard’s refusal to apologise to City Mayor Patricia Chase-Green for telling her to “shut up and listen”, the women’s arm of the People’s National Congress Reform (PNCR). The National Congress of Women (NCW) made it clear that it was not commenting on any issues that prompted the probe into the running of the municipality, but stopped short of suggesting that he discriminated against Chase-Green because of her gender. “We do want to comment on the totally unacceptable remarks to the Mayor, and to ask if the Chairman would have been ungracious and disrespectful to a male witness,” said the NCW. That organisation’s executives and members protested Kennard’s, attitude towards the Mayor who is a former member of the PNCR’s executive up until that party’s last Congress that was held in August. “We protest most strongly the display of arrogance and hostility of the Chairman. Surely, he could have been less crude in addressing the Mayor and this apparent hostility, we feel, may cause his final decisions to be suspect and partial,” the NCW added. Kennard, a former Chancellor of the Judiciary told the Mayor last week Friday if she did not care to shut up and listen and told her to keep her attitude for City Hall. The Inquiry Commission Chairman apparently became upset after she questioned one of the Attorneys-at-Law for the Commission of Inquiry. He also repeatedly urged her not to attempt being rude. When the Commission of Inquiry resumed on Monday, former Magistrate Maxwell Edwards, who is representing Town Clerk Royston King, was politely urged by the police orderly to speak in a moderate tone of voice to Kennard. 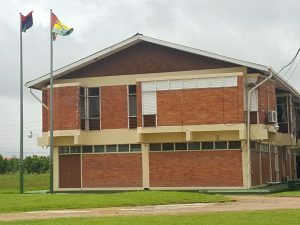 Edwards refused to obey the orderly’s instructions, shouted at him and said he had no place telling him what to do and he would only take such instructions from the Inquiry Commission Chairman. Kennard did not intervene, but instead sought to soothe Edwards. On Monday, Kennard made it clear that “I have no apology for making that statement” before stressing that he was committed to conducting his investigation impartially. 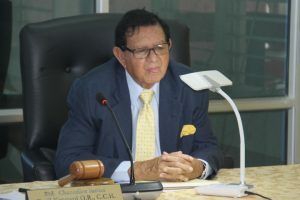 Kennard noted that he has been a lawyer for 56 years during which he had been appointed State Counsel and seconded by then President Forbes Burnham to Antigua and Barbuda as Director of Public Prosecutions. Before his three-year secondment had been completed, Kennard said Burnham had recalled him to Guyana and appointed him a High Court Judge. He was subsequently appointed a Justice of Appeal and Chancellor.